THP 2-13-012 SIS (Connor Meadow THP) Campbell Timberlands, 786 acres; 44% commercial thinning, 33% selection, 23% variable retention, 1% roadside logging. Pig Creek (MD: T39N R2W Sec.18, 19, 30, 31; T39N R3W Sec.24, 25, 36). Winter operations, moderate erosion hazard, steep slopes up to 65%, unstable area, 5 road drainage work sites, oversized units, herbicides, willow flycatcher buffer area, goshawk & fisher sightings, rattlesnake fern, scattered large trees. Estimated public comment deadline: 05/29/13. 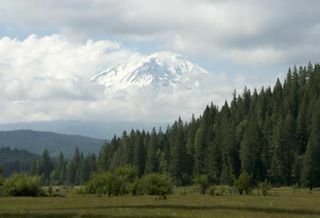 This THP is about 3 miles south of the town of McCloud, CA at an elevation of 2800 - 3450 feet. Campbell Timberlands is planning a mostly tractor and cable thinning operation in mixed conifer stands near Squaw Creek and Connor Meadows. Tractors are planned for use on steep slopes between 50 - 65% on established skid trails, and in cable logging areas to establish tail holds and yarder guide lines. There is an old skid road that caused a small slide within a stream channel. Unit 1801 has a buffer area for Willow Flycatcher habitat along the southern end of Connor Meadow. Both goshawk and fisher have been seen nearby, and Rattlesnake fern was found near a spring in Section 30. There are 5 oversized units. More information is available on the THP Tracking Center website.